The 57 metre classic sailing superyacht Fleurtje, listed for sale by Heikki Luoma at Compass International, has had a €500,000 price reduction. She was designed by Robert Clark and built at the renowned Dutch shipyard De Vries Lentsch with delivery in 1960. Previously known as Carita and then Argonaftis, she had a full refit in 2005. Featuring highly polished teak throughout, she accommodates 12 guests in six cabins consisting of a master suite, two doubles, two twins and two singles with Pullman berths, all with marble en suite bathroom facilities. 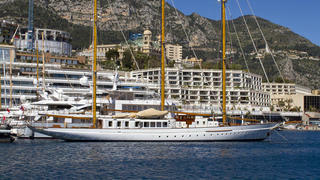 There are also quarters for 10 crew aboard this yacht for sale. At 57 metres, she is one of the world's largest sailing yachts, and yet retains extremely elegant lines. The long overhangs at bow and stern, the white hull and three Douglas fir masts with staysail plan combine into a handsome profile. Her steel hull and aluminium superstructure are in splendid condition having been faired and repainted, giving her a white hull instead of blue, during her 2013/2014 refit. The acclaimed naval architect Gerard Dijkstra was brought in to optimise sailing performance, thus resulting in considerable speed and handling improvements. Since launch, she has undergone four refits and been maintained to Lloyd’s class standards. Such is the degree of ongoing improvements that she is now one of the finest three-masted schooners afloat. Lying in Valencia, Spain, Fleurtje is now asking €8,400,000.